Planning a vacation, last minute travel and taking your pet is out of the question, Ozark Hills K-9 Inn is the place for your pet. Relax and enjoy knowing your dog is safe, secure, comfortable and most of all being cared for the way they are accustomed to. Our kennels are heated and air-conditioned indoor private area for sleeping, eating and drinking. We have multiple size rooms 4×7, 5×5, 5×7 and 5×10 with 10ft long outside covered runs via doggie doors. There is ample space for any size of dog or multiple family pets. A clean room is very important for your pet’s well being and happiness. We clean and sanitize our rooms frequently each day. You are welcome to bring your pet their favorite toys, treats and a blanket or towel to make them feel safe and secure. We however recommend that you not bring their cushy pillow or bed from home as most such items are not easily washable if soiled. We want to ensure your pet always has clean bedding during their stay. We also suggest you send some piece of clothing with your scent to help be more comfortable while staying with us. Each room has their own raised cot for their comfort of sleeping or resting. Special water bowls are provided for your pet to ensure that there is always plenty of water without the risk of spillage. 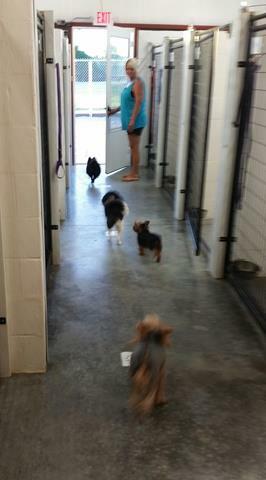 Our kennel features lots of natural lighting and we play calming music in the background. 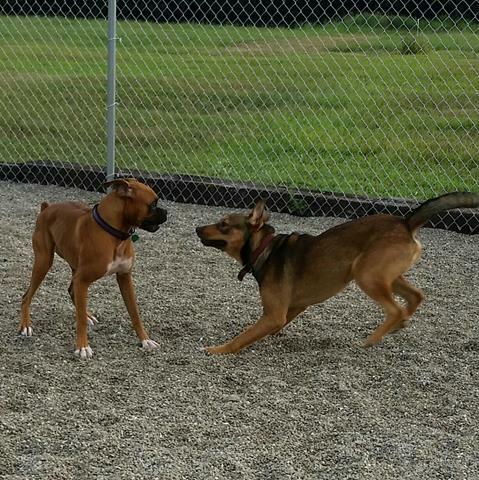 Your pet will get lots of exercise time, outdoor play and time to just sniff around in our large fenced in play areas. There are three planned off- leashed exercise times or more if they just like to be outside enjoying fresh air. We are here to cater to their wants and needs. We ask that you provide food for your pets during their stay. We do have healthy dry food available but it’s much easier on their digestive system and reduces stress level to have what they eat at home. We do not allow raw meat but if you bring canned or cooked meat that will be fine. We will do our very best to accommodate special diets. We also provide a snack for your pet. As dog owners ourselves, we know how much our friends love their snacks. We can administer medicine for your pet – oral and topical only. For the health and safety of all our guests, all dogs must have a current veterinary vaccination record which must include DPP/ Rabies/ Bordetella. All dogs must be flea/tick free. Any dog found infected with be treated at owner’s expense.